What do you do and what is your role in Social Enterprise? I am a faculty member in Entrepreneurship Development Institute of India. I’ve worked there since 1996. My major area is Economics, rural marketing and SME cluster developments. Entrepreneurship is one of the important areas our institute pursues. We promote entrepreneurs through different activities and training programmes. We have a programme called EDP (Entrepreneurship Development Programme). We have conducted such projects since 1996. Some of our graduates are doing extremely well both inside and outside India. We have provided many entrepreneurs globally. A second part of our work is improving the businesses of existing entrepreneurs, helping them to improve their productivity, their output, their revenue etc, and helping them move to the next trajectory of growth. Apart from these developments, we are doing a lot of activities to ensure there is the right eco-system for entrepreneurs to develop and be nurtures. It may be a bankers programme, a programme for the industry associations, for government officials and more. For the last 15 years we have introduced entrepreneurship education in the sense that we offer postgraduate diplomas in business entrepreneurship. It is a two-year programme. We have around 120 students. Through the programme, we provide inputs on management and entrepreneurship. The difference to a typical MBA is we provide all inputs on entrepreneurship. The objective is very important in the sense that at the end of the programme they start their own enterprise and become successful. There is another specialisation we focus on in, which is Family Business Management. It’s common for a father to manage a business successfully, but subsequent generations suffer. How do we inculcate a culture of successful planning in the next generation of enterprise so they don’t just run it as their father did, but move to the next level of growth? This is one of the important domains we cater to and have for over 25 years. We have been working with many international agencies in terms of serving the cause of entrepreneurship development and taking existing entrepreneurs to the next level of growth. 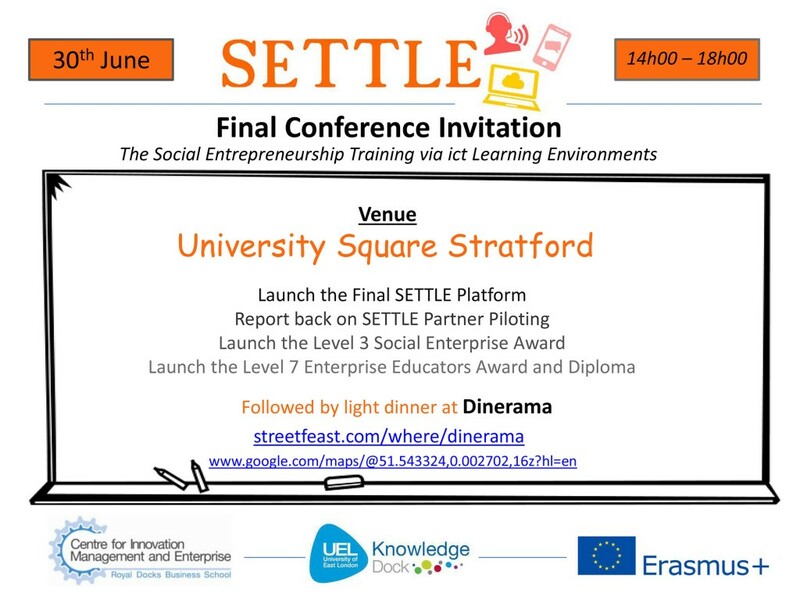 Recently, we started our endeavour in terms of promoting social entrepreneurship, hence our collaboration with UEL. The ultimate objective is that a limited number of colleges and universities will offer entrepreneurship as a programme or an embedded programme in their existing courses. In order to ensure success, we’re helping with the materials of the modules (i.e. reading materials). We are developing all the modules which help students read and understand what social entrepreneurship is. The social angle is getting increasingly important. It is to promote businesses that don’t pollute the environment but minimise it, for example. You should promote businesses which should reduce global warming (for example). Good practices are the basic principles which need to be promoted, and that is partly done through social entrepreneurship. Social entrepreneurs promote causes facing a society through their activities. If it is an employment problem, for example, we should promote businesses who can help manufacture activity. Social entrepreneurs should earn profit but also address one of the problems facing their society. The global economy needs social responsible enterprises. An important aim for us is to help students understand that they can be a social responsible entrepreneur. They can be a doctor, an astronaut, a social entrepreneur. We want them to understand that. He or she should be able to create jobs for people in their vicinity. The overall objective is to promote socially responsible businesses. Traditionally in India I imagine you have mostly had men do these training programmes. Is this changing? Average statistics show it is highly biased towards men but there is some change happening and there will be more women taking business as a career opportunity more seriously. It is happening more in the highly educated sectors of society. But people in rural areas show limited examples of women promoting new ventures. We have created a particle called Centre for Women Entrepreneurship which tries to promote women entrepreneurs.